Dealing with a Shoe Crisis! Even though November feels too early to start thinking about Christmas, the signs are all around me (eg Christmas decorations, advertisements for gift ideas and invitations to social events), so it is hard to ignore! Do you have more social engagements now than at other times of year? I know I do. Have you worked out what you'll wear to each event? If so, I do hope you've actually tried on the complete outfit(s) to make sure all parts of it work, especially if you haven't worn any of the items for a while. It's also a good idea to work out tweaks, or alternatives, for a last minute change of weather. This was brought home to me just recently - see my recent experience below (Dealing with a Shoe Crisis)! If you haven't got festive season outfits worked out yet and need help, reviewing your wardrobe, creating outfits, or shopping, let me know (respond to this email) and I'll get in touch to see how I can help. Also, a reminder that to mark the occasion of 100 newsletters (last month) I'm offering you, dear reader, a 15% discount for either my in-person colour analysis (if you're in Sydney), or my online color analysis. This offer is valid on orders through 15th December 2018 (you can use the service within 3 months of your order). Simply reply to this email to place an order and I'll respond with what to do next. 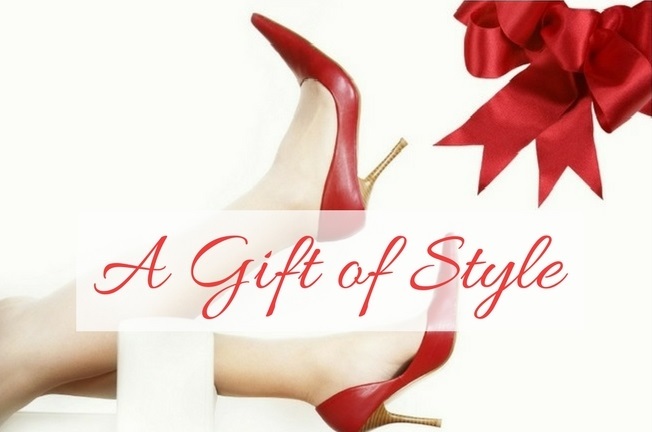 For a relative or friend who has expressed a frustration with finding clothes, picking colours, or creating outfits that suit them, a gift voucher for some form of style makeover service is a lovely idea. Or, perhaps you'd like this gift yourself? If so, let the gift giver know! I offer gift vouchers for any of my image services (either in person here in Sydney, or any of my online services). An idea for an in-person Colour Analysis or Dressing Your Shape Consultation is to have a consultation yourself and give a gift voucher for your friend to join you (see the group pricing). To order simply reply to this email or phone me on 0403 747 199 and let me know which gift you'd like to give, or what amount you'd like the voucher for. I'll get back to you for details. I had a charity event to attend and thought I knew exactly what I was wearing. However, on the day of the event the weather had changed from cool, to warm and very humid, so I couldn't wear my planned footwear and hosiery (ankle boots with opaque tights). 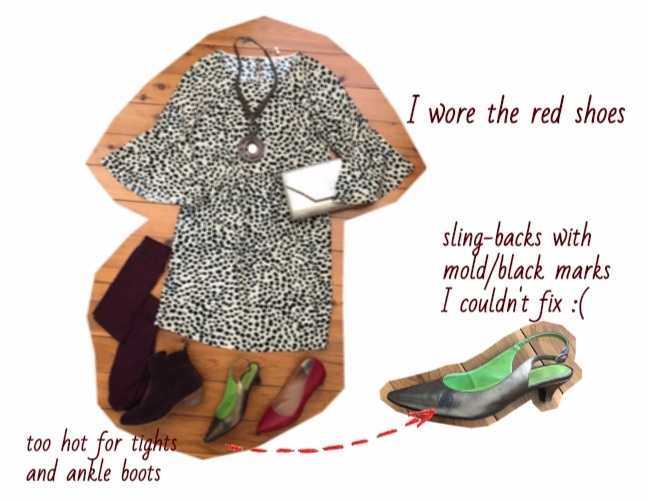 "No problem" I thought "I'll wear my coppery-bronze kitten heel sling-backs". However, I found they had some horrible black mold on them in a very obvious spot and I had no time to see if I could remove it! Luckily I did have another pair of (less comfortable) shoes I could wear. However, for a moment I was in a panic (horrible feeling)! That experience got me to review my spring and summer shoe wardrobe. It resulted in me giving 3 pairs of shoes and sandals I was no longer wearing (they were too uncomfortable or too high) to charity, and throwing out my much-loved, but worn-out, burnt orange Birkenstock's. (I'm still waiting to see if my lovely sling-backs can be resurrected!). And during my recent trip to Western Australia I found my tan sandals weren't as comfortable as they once were (the lining is worn and wrinkled and giving me blisters -- I can now only wear them when I don't have too far to walk). Even though it's tempting to try and get one pair of shoes to work for every occasion (especially useful for travelling), that really doesn't work in practice! The number and type of shoes you need will depend on your lifestyle. The more varied your activities the more shoes you'll need. These are what I found (see picture below). I haven't received the new Birkenstock's yet (the casual sandals), but the other 2 pairs are working out well, and I'm sure the Birkenstock's will too! It feels good to have my warm weather shoe wardrobe sorted! (Now the weather just needs to co-operate -- it's raining cats and dogs here in Sydney today!). Copyright © 2018 Style Makeover HQ. All rights reserved.